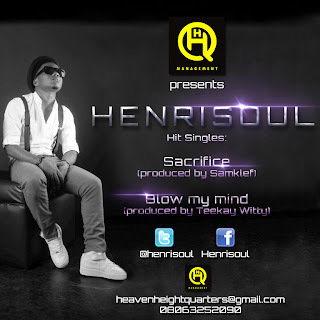 Henrisoul, the award winning, multi-talented singer/songwriter/performer who blew the airwaves with the popular ‘Your love’ single is back with two new hit tracks that are sure to keep you bumping. If the first single doesn’t make you want to ‘sacrifice’, certainly, the other is sure going to ‘blow your mind’. ‘Sacrifice’ is an upbeat fusion of techo, afrobeat and highlife all into one and is produced by ‘Samklef’ while ‘Blow My Mind’ is diffusion of techo and Fuji. It was produced by the prolific ‘Mr Witty’. Both songs are mixed and mastered by ‘Doxology Music of South Africa’. HHQ Management is proud to present these 2 hit singles for your hearing pleasure.